1. 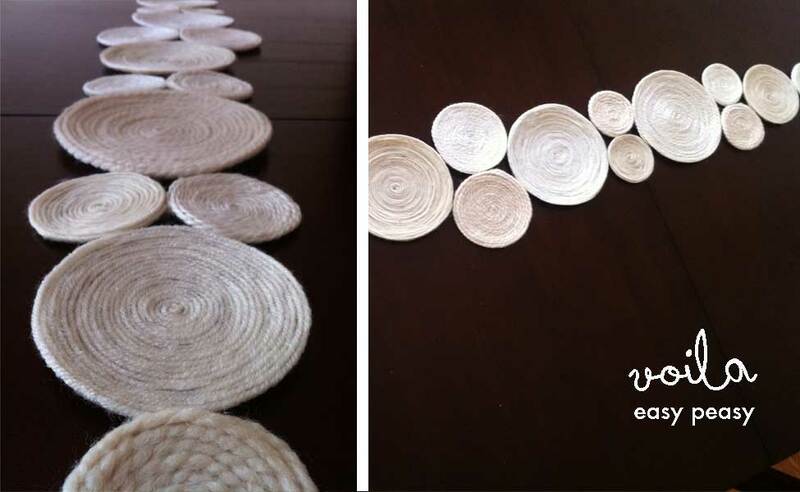 It’s so dang easy that if you felt like making a bunch of these for your wedding centerpieces, you totally could. 2. 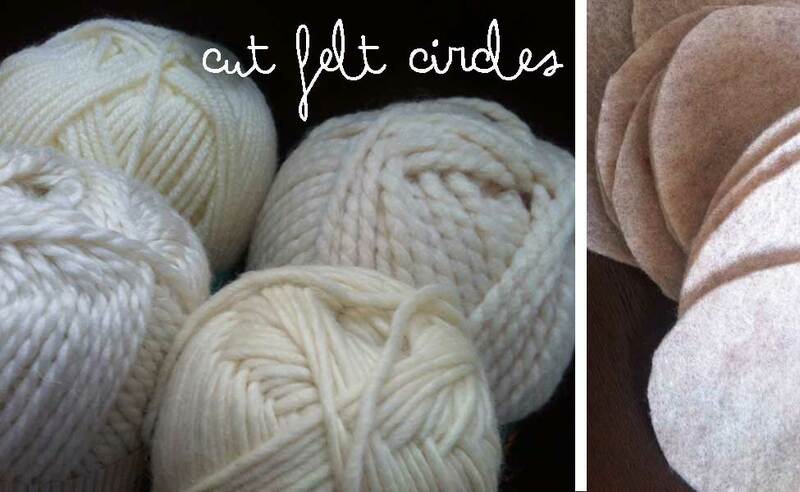 You get to upcycle leftover yarn…it really doesn’t use a whole ton. 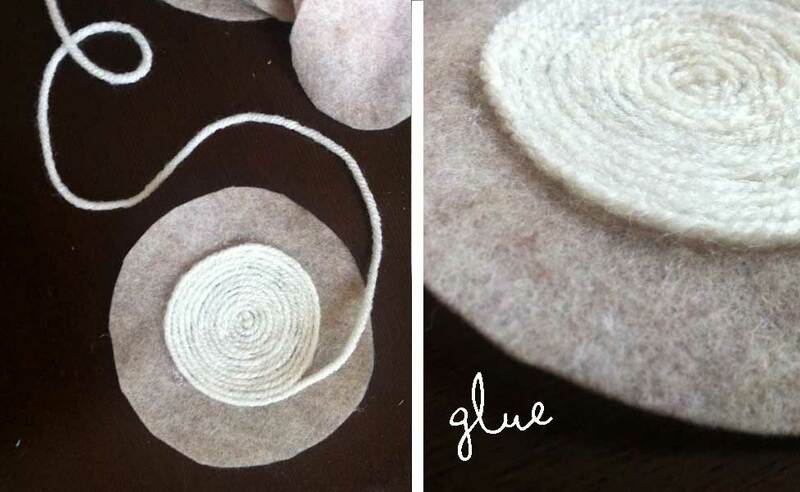 Besides the yarn, all you need is three pieces of felt and some glue (hot or tacky). 3. 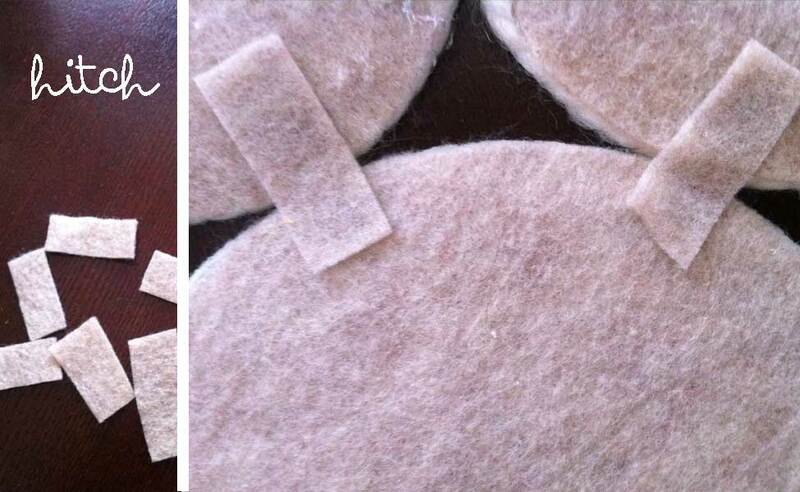 I’m a huge fan of instant gratification and projects that are under two hours, start to finish, make me smile. Check out video tutorial I shot with the gang from SantaFe.com. 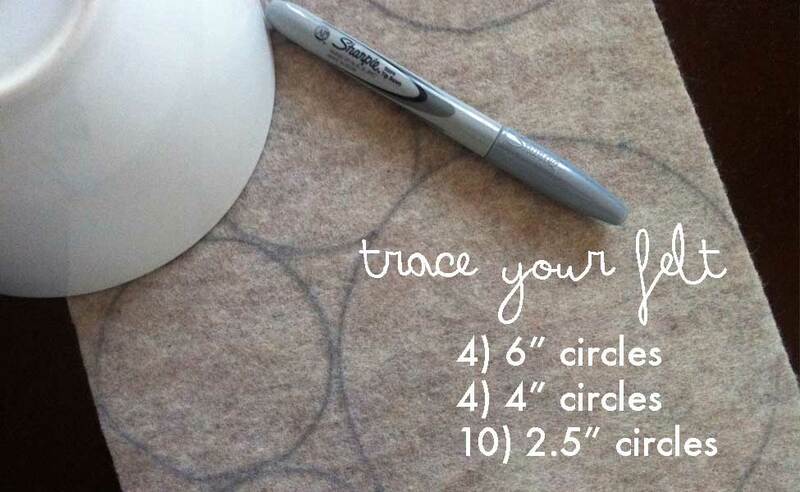 It’s some good ol’ fashioned glue gun fun at it’s finest! The Hitching Post with Jessie Abrams Baca | Yarn Runners from SantaFe.com on Vimeo. 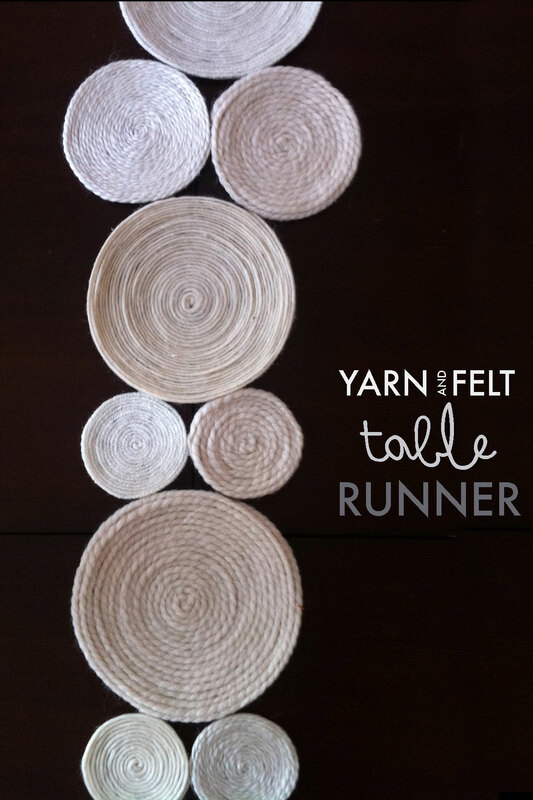 And, click here to see the wildly colorful runner I created last winter. It’s so fun! 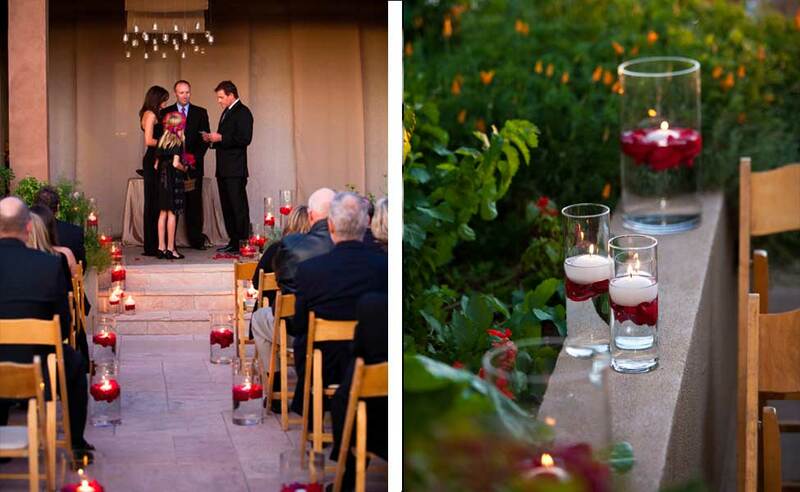 Picture this: a beautiful, outdoor wedding ceremony surrounded by lush greenery and fragrant flowers. Why not document it the old fashioned way, with paint! 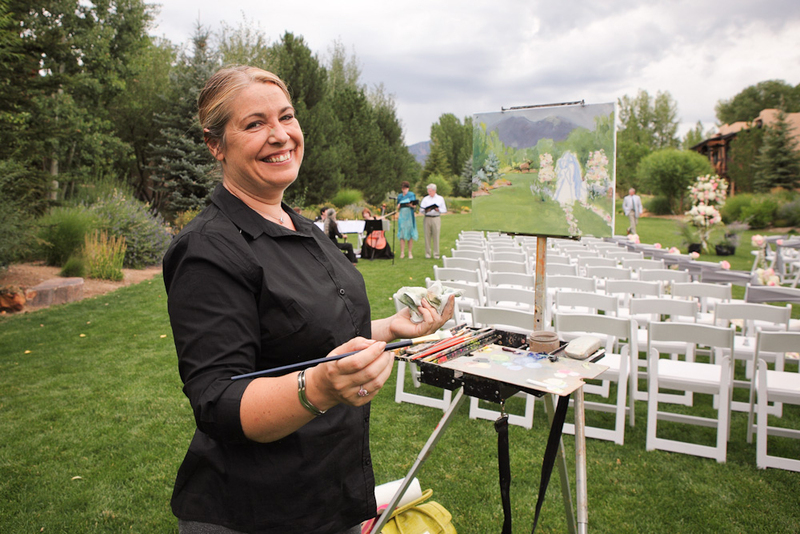 Here are photos from a wedding I did last summer in Taos, which was held at El Monte Segrado, a beautiful resort setting nestled in the Taos valley. 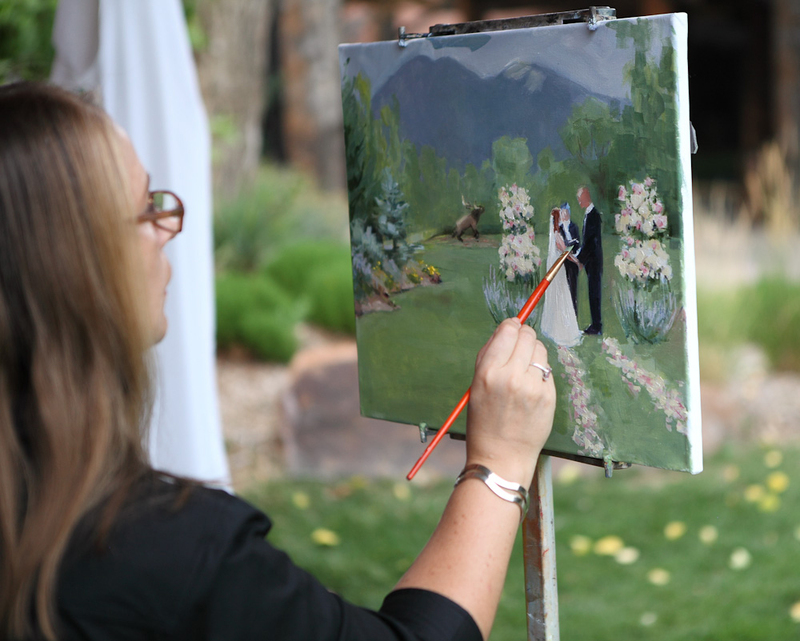 We were excited to have a fine artist, Elizabeth Jose on site to capture the vows on canvas. 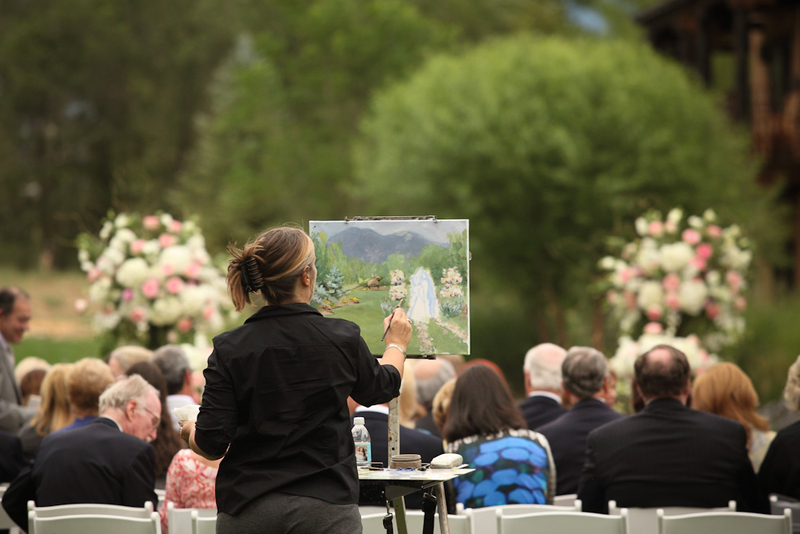 She began blocking in the surroundings as guests arrived, sketched out the couple during the ceremony and finished the details during the cocktail hour, as guests sipped drinks and watched her apply delicate brushstrokes. What a wonderful way to remember such a special day! More photos of this beautiful wedding to come soon! 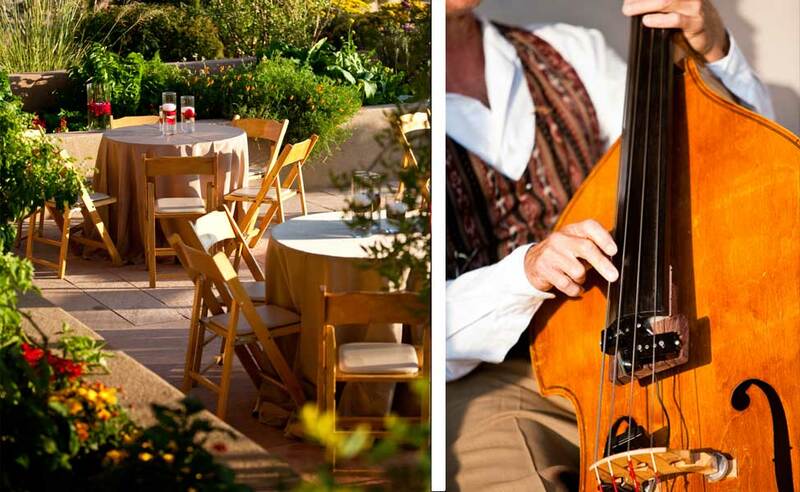 Here are some snaps from a video shoot that I designed for Inn and Spa at Loretto, one of Santa Fe’s most popular destination wedding venues. 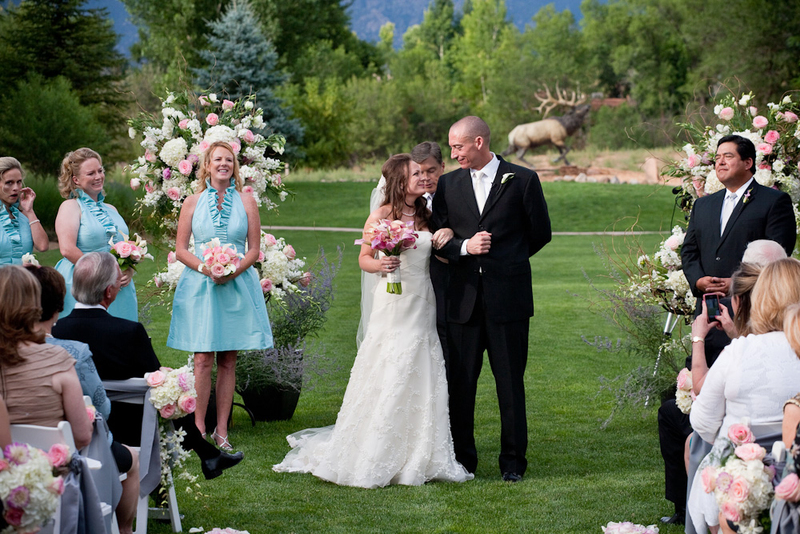 They were named 2012’s Best Wedding Destination by the Travel Channel and were featured on their “Best Of” episode. I styled a bride and groom in all the typical events of the wedding day: a ceremony, cocktail hour, the reception and even the spa! My favorite part about this project was that I had complete creative license. 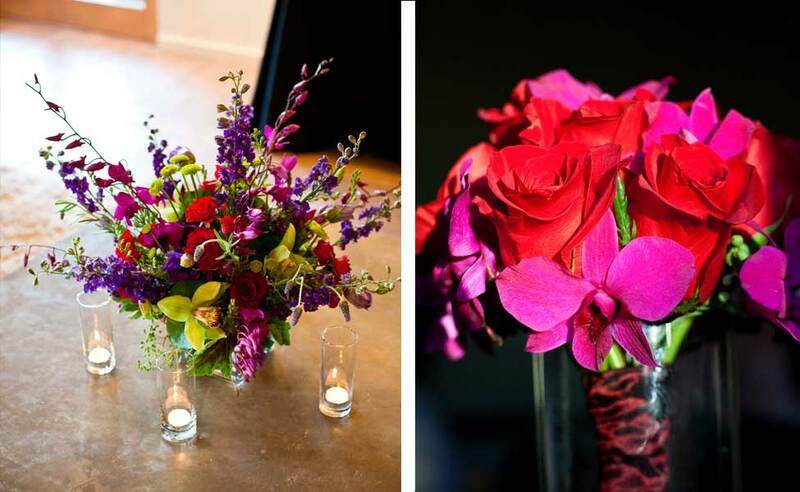 As an event planner, I typically play the role of consultant, where I help clients work off of themes they already have in mind. 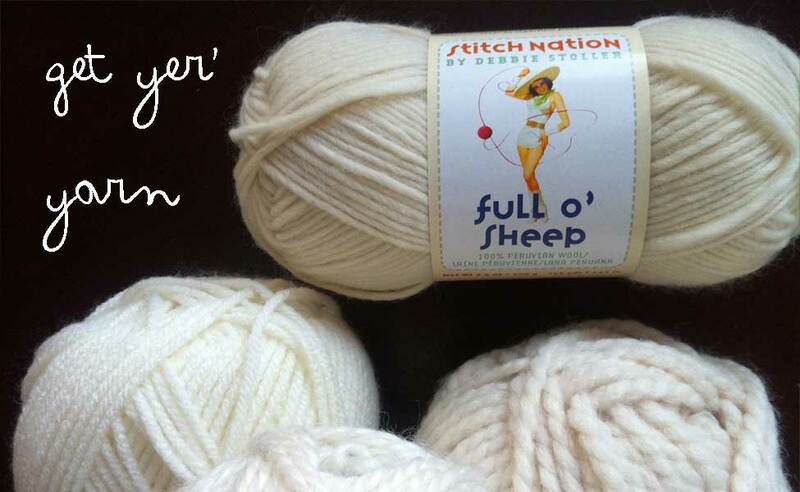 So, it is such a treat when I get to start from scratch and design and style the whole shebang! To mirror the elegant Southwest vibe the Loretto offers, I centered the design around a unique and beautiful color palette. I chose colors like coral and peach paired with gray/greens. 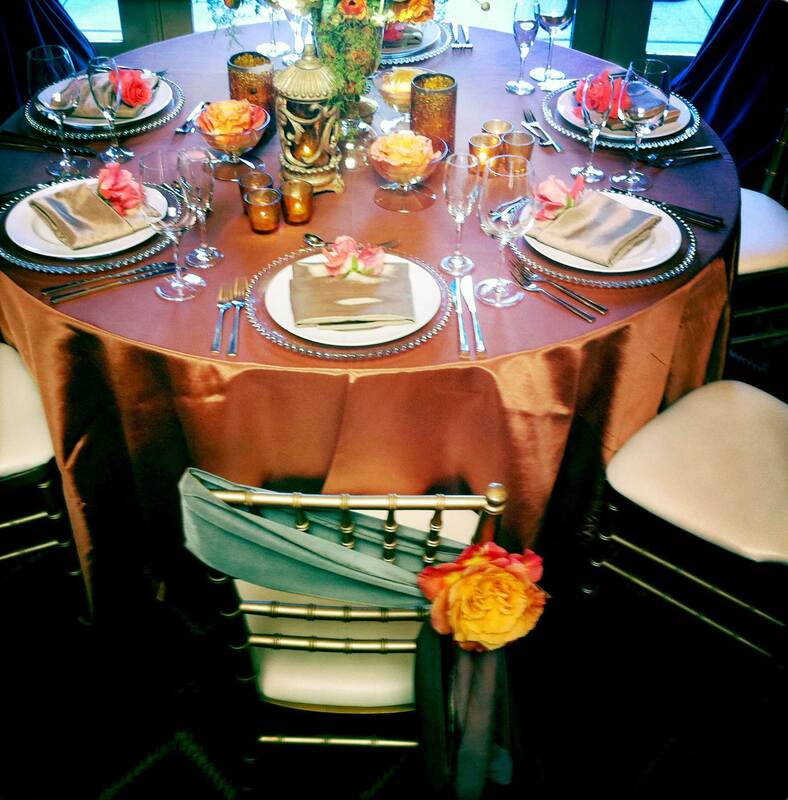 I accented the tabletop with metallic coppers and golds. 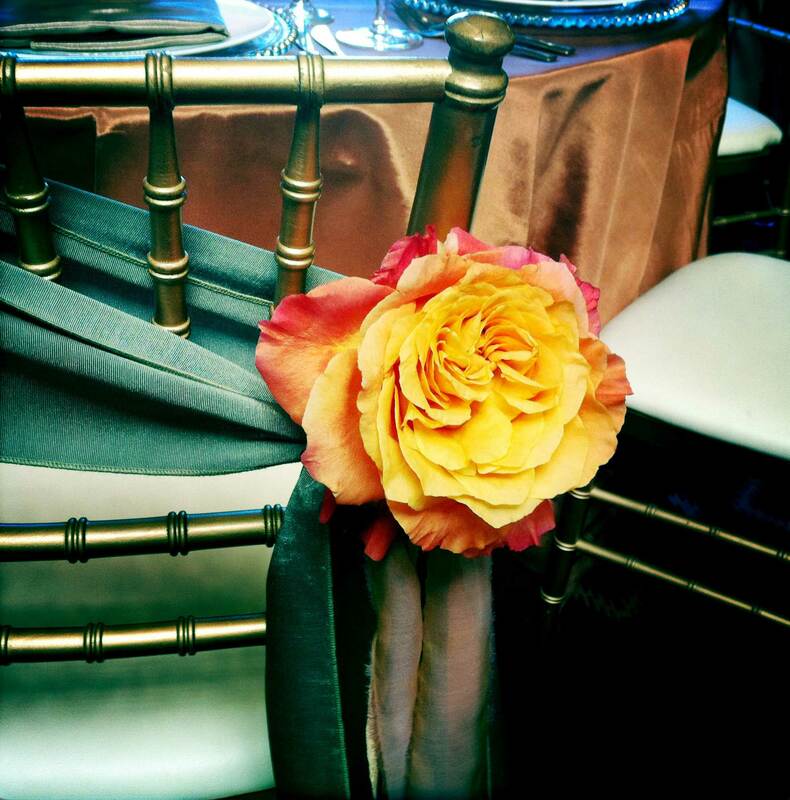 The flowers provided by Marisa Peluso popped beautifully off of the linens provided by Classic Party Rentals. I even designed the look for the lovely couple’s ensemble. I had a blast attending a fitting at the elegant bridal atelier, Laura Sheppherd. There we chose a dress to coordinate with our theme, as well as a beautiful veil and jewelry. Monica Stark of Makeup Santa Fe perfected pouts and rosied cheeks with her incredible make-up artistry! Our couple, Jamy and Erik are friends of mine and what I love most about this shoot is that they are married in real life. They eloped, so they only had a few disposable camera pictures of their wedding day. 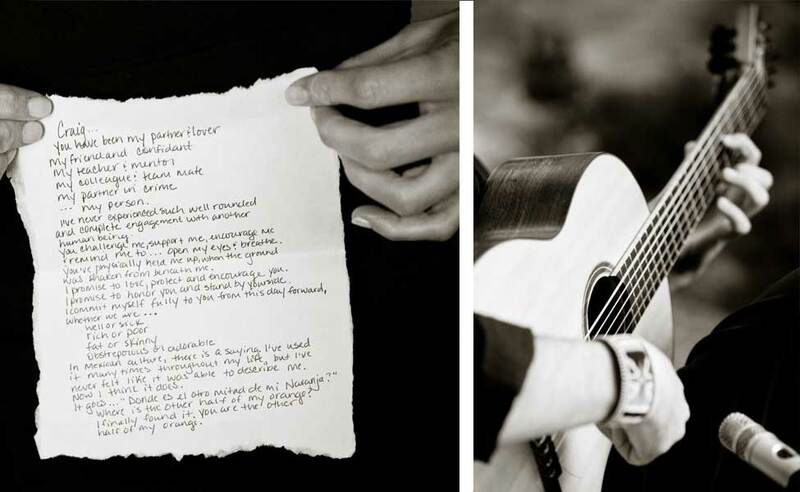 This shoot recreated a magical moment for them both and let them fill in their wedding album! Part of the shoot centered on the wedding cocktail hour where we showcased delectable appetizers and a Prickly Pear martini with a gold leaf rim. Yum! I put together a little behind the scenes video for you to see. Disclaimer *** I am by no means a professional film maker and all of this was shot with my iPhone; so it’s not exactly Oscar-worthy, but it does give some insight to our process. Inn and Spa at Loretto “Best Of” Shoot- Behind the scenes from Jessie Baca on Vimeo. Just a lil' preview of some goodness to come! 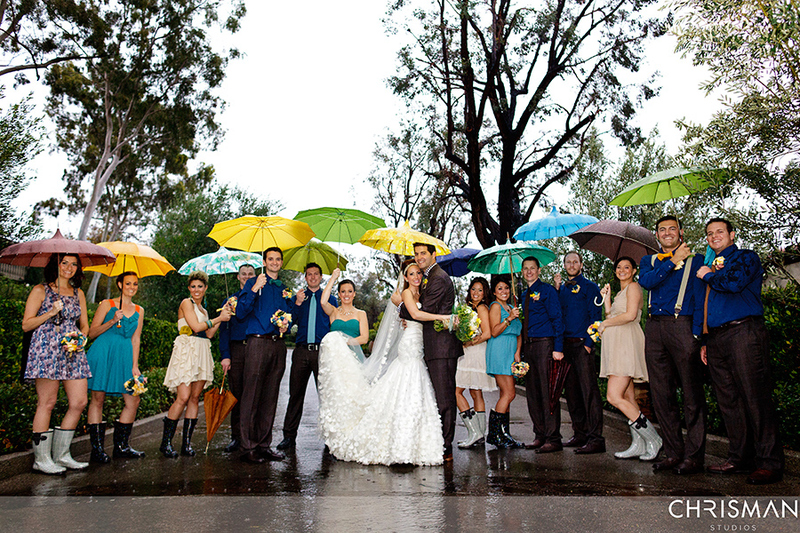 Photo from Ben Chrisman and glorious vintage umbrellas from Bella Umbrella. ¿Donde es el otro mitad de mi naranja? In other words, “Where is the other half of my orange?” This may seem like an odd saying; but incorporated into Amber and Craig’s wedding vows, and thus creating a whole orange, it couldn’t be more appropriate. 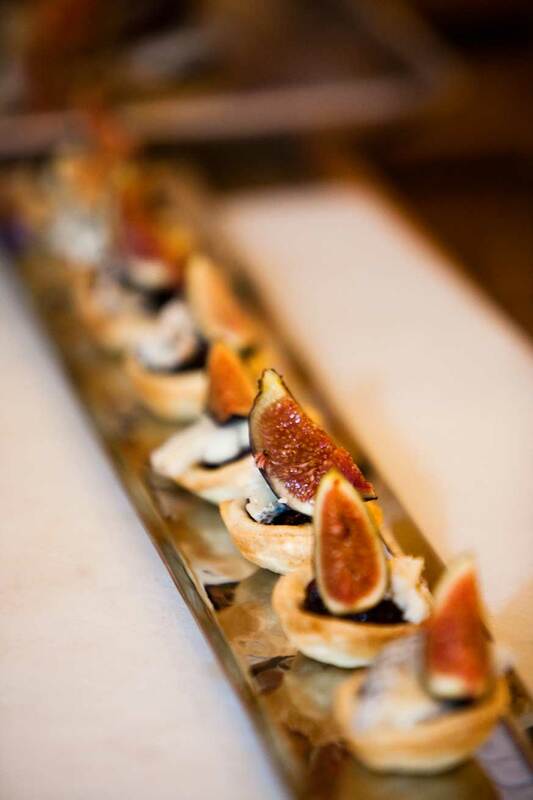 These two foodies and lovers of all things yummy came together last fall for a beautiful gathering of heartfelt nuptials, a gourmet feast and stunning Santa Fe sunsets. 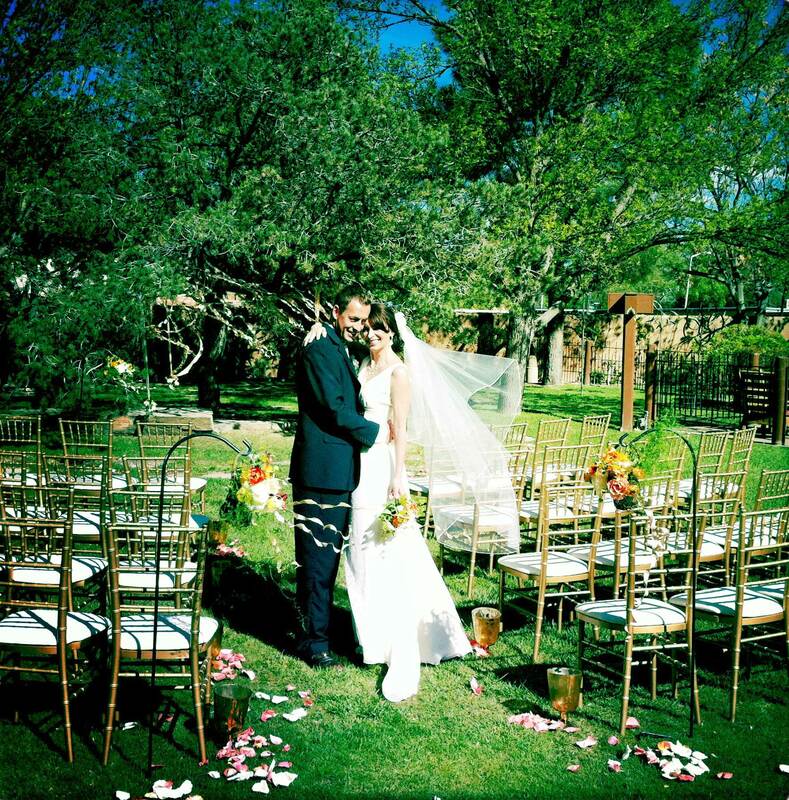 The two-day wedding was held in the modern home they share together and began with a gathering set on their own backyard patio and surrounding vegetable garden. 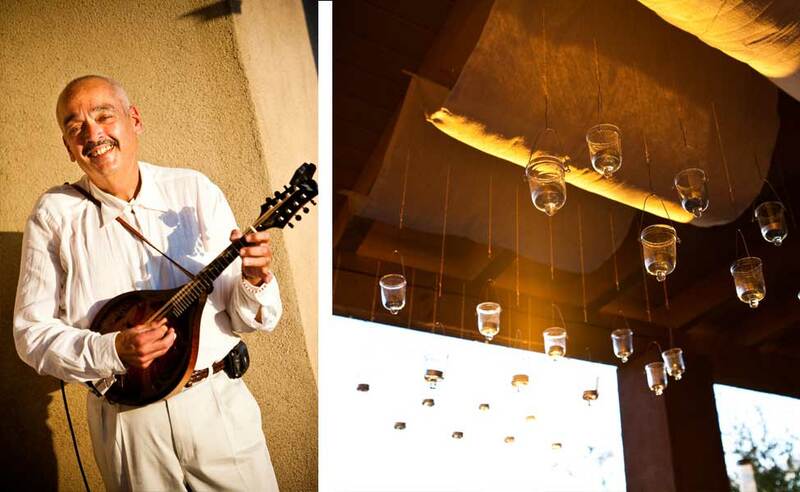 The first evening featured an intimate sunset ceremony with personal vows, gentle Spanish guitar and lit only by hundreds of twinkling candles. We covered a large woodpile and kitchen window to create a ceremony space with linen fabric panels that I designed and assembled. 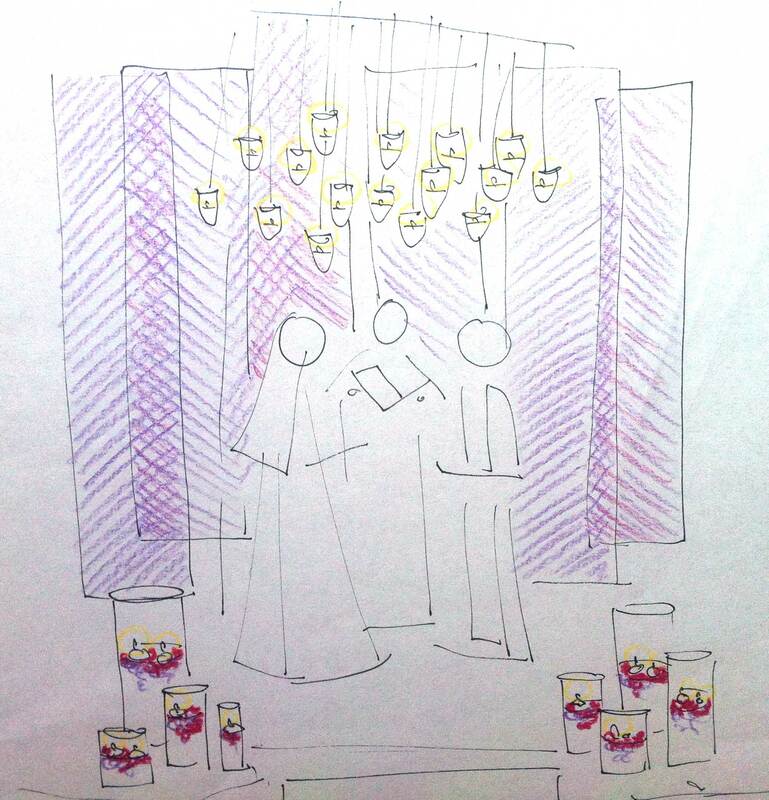 Since the space was asymmetrical, I created a halo of hanging candles above the couple to bring focus to the “I Dos”. The result was a contemporary, neutrally colored space for a modern couple. Here is a sketch I used as we were brainstorming. I’m always amazed at how things actually turn out when they go from colored pencils to nails, dowels and fabric! 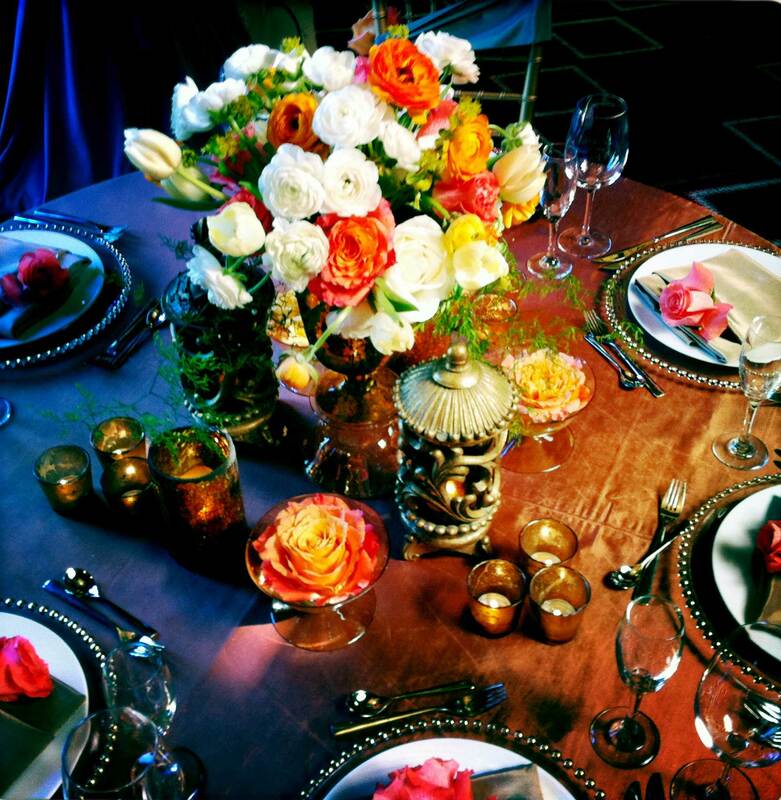 The neutral color palette was accented with vibrant flowers from Artichokes and Pomegranates. 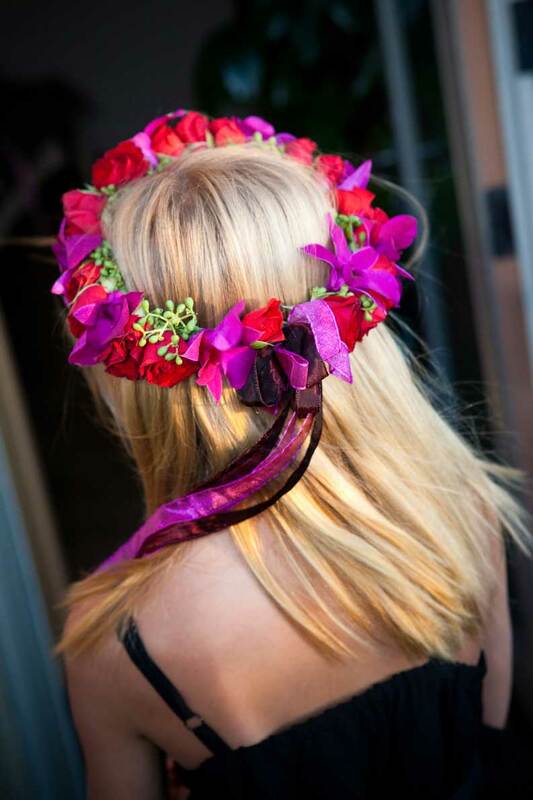 Lucca, the flower girl, was so excited to wear a head wreath made from red spray roses and fuchsia Dendrobium orchids. The second day’s festivities were kicked off with sounds from Savor, who specialize in Cuban street music. 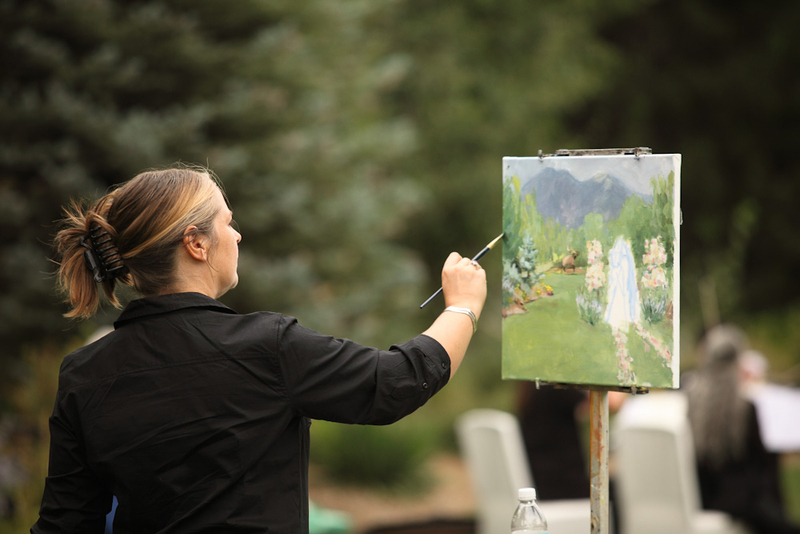 Since the main focus was food, tables were set in the garden to allow all the guests to indulge in an incredible spread provided by Marja Custom Catering. Now for the food part. I hope you’re ready for this…if you’re even the slightest bit hungry you will be salivating on your keyboard by the end of the post….don’t say I didn’t warn you! 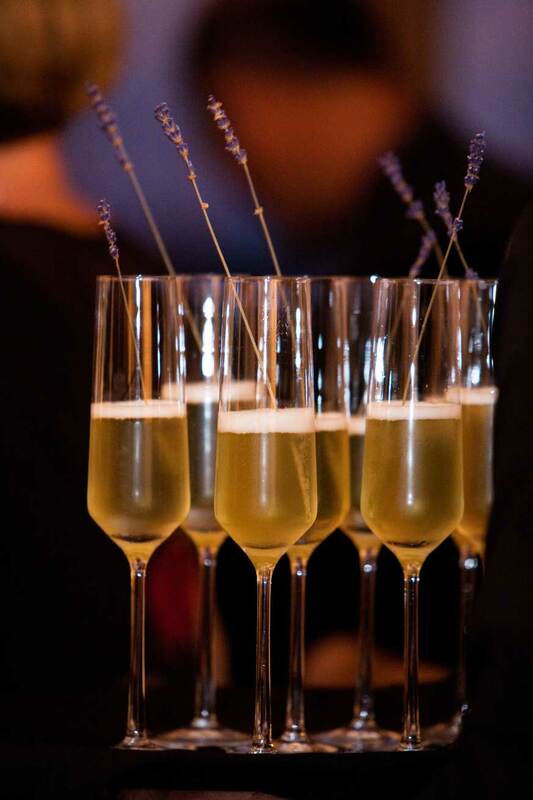 Guests were greeted with a lavender-infused champagne with fresh picked sprigs of lavender to garnish. This next part was my favorite piece of the entire weekend: a CHEESE cake! Amber and Craig were an avant garde couple who didn’t want to bother with sugary frosted cakes; so when I suggested they have the ultimate foodie treat: a cake made of glorious wheels of cheese, they we’re all for it! 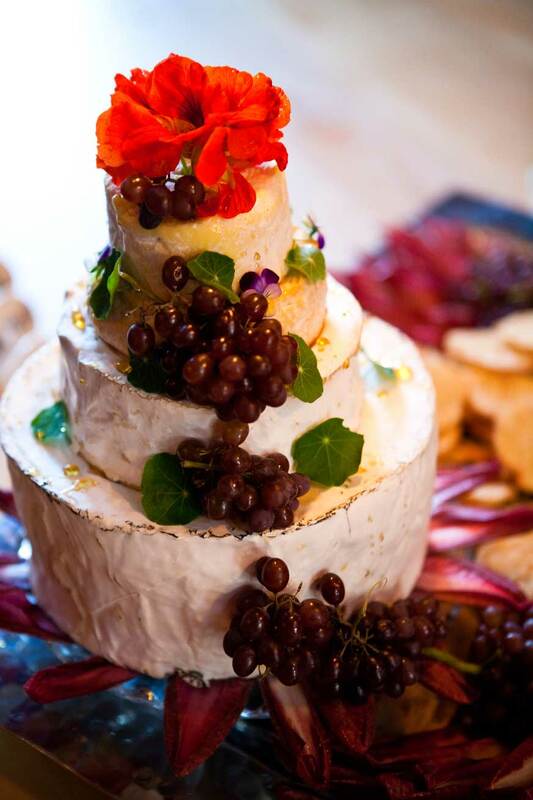 Marja’s talented chefs, Marc and Jean-Luc did a beautiful job of decorating this masterpiece with baby champagne grapes, artisan honey, purple endive and edible nasturtium. Since the wedding took place in late-summer/early-fall, we were able to take advantage of the season’s final heirloom tomato harvest. 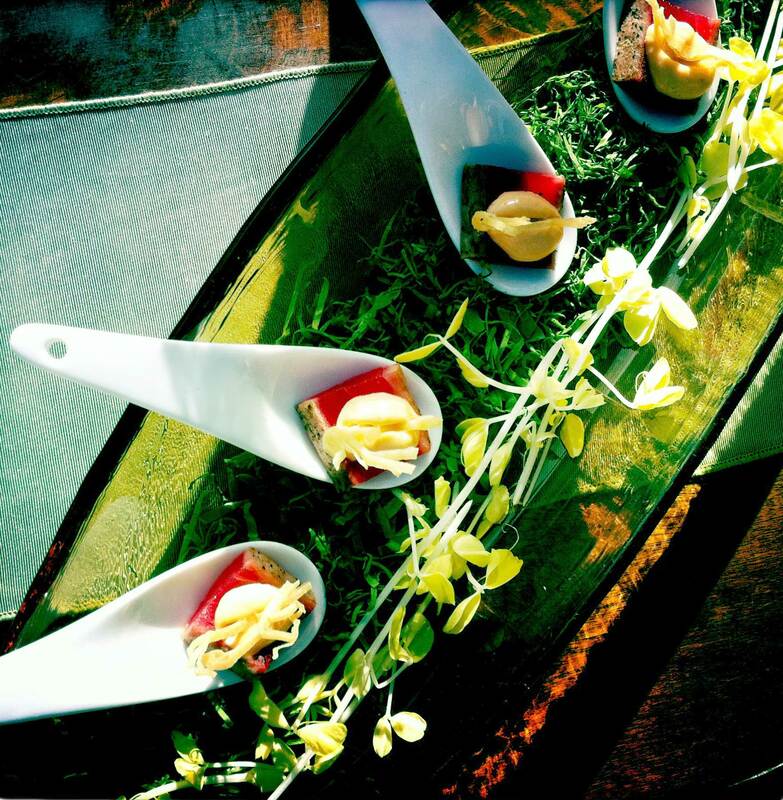 Marja sourced the most beautiful tomatoes from the farmer’s market as well as from Amber and Craig’s own garden. 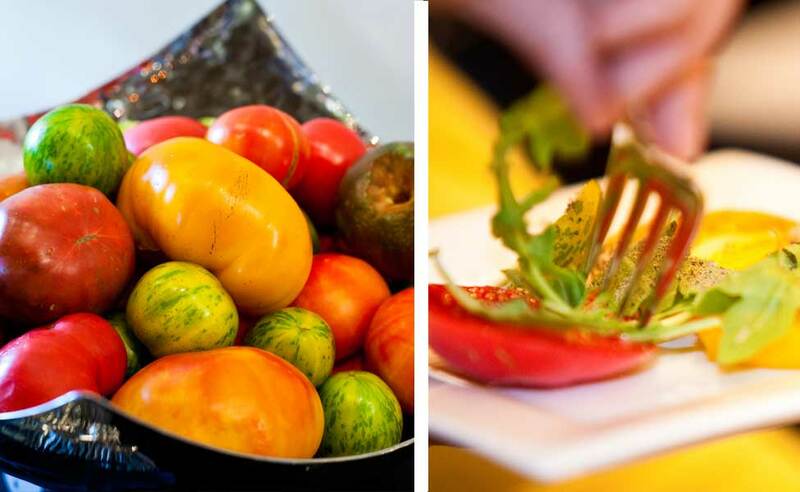 We created a fabulous action bar for guests to decorate their hand sliced tomato slabs with burrata, Italian Basil pesto, infused Balsamic vinegars, and an array of sea salts. Holy molars, this was a hit and tasted so amazing! 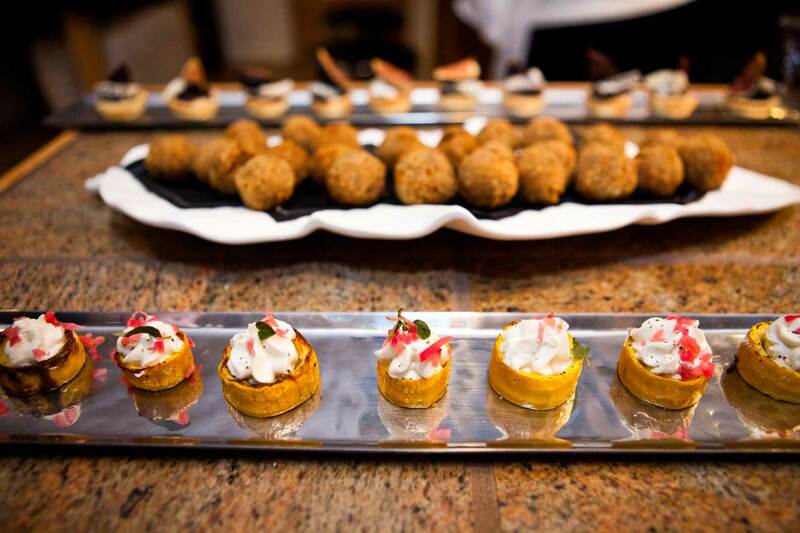 Guests were also greeted with incredible bite-sized hors d’oeuvres that tasted as beautiful as they looked. Amber and Craig wanted to gift their guests with a yearly reminder of their weekend spent in Santa Fe, so I created an adorable favor of tulip bulbs wrapped in special bags and a tag saying. “Thank you for joining us! May these tulips be a constant reminder of our love we share with you! ~ Amber and Craig”. 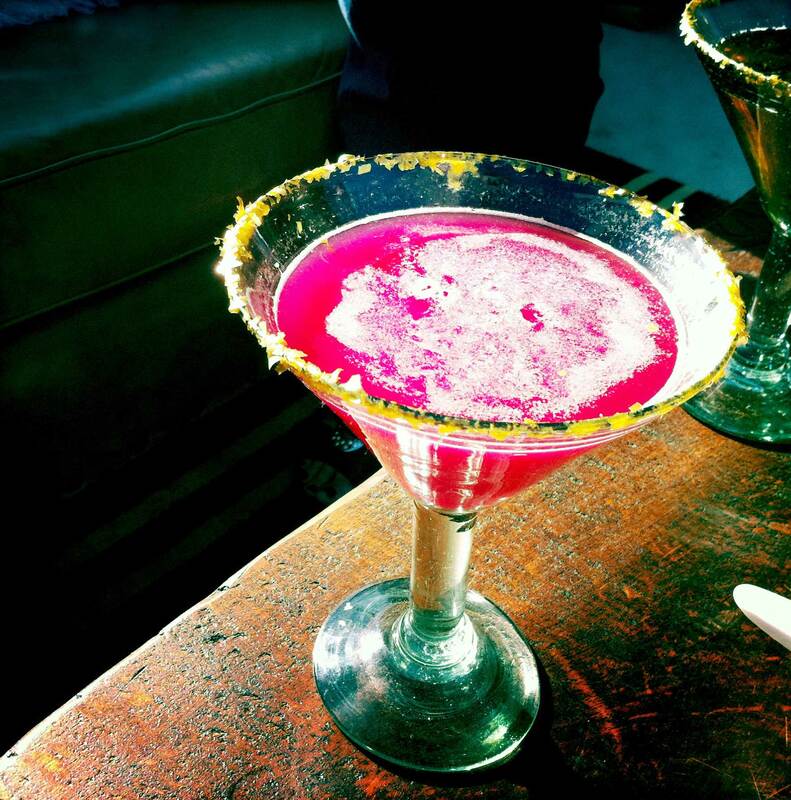 As the evening wound down, the candles continued to glow and the laughter and smiles bubbled like the champagne. 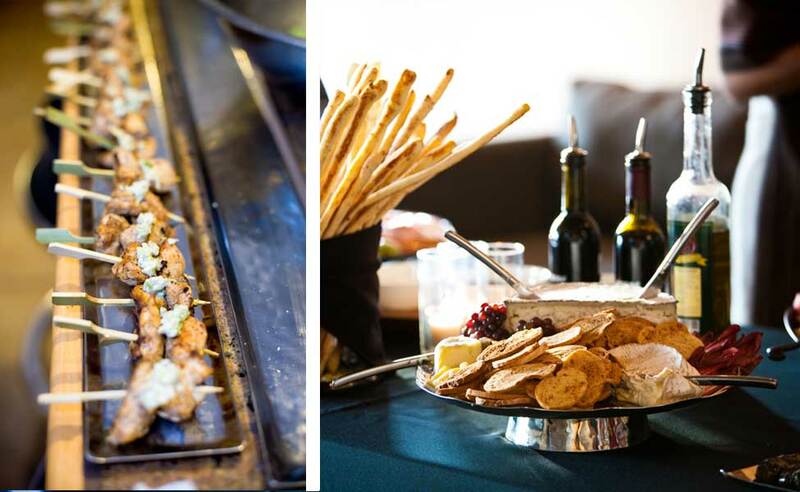 It was a truly memorable event with so many gourmet delicacies and special treats. 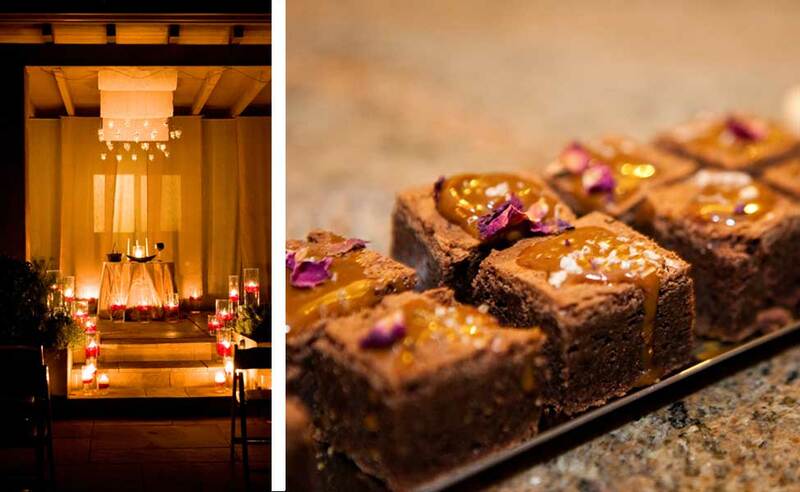 To see the complete menu and tease yourself with more amazing foodie treats, read on!